Real Business takes a look at the social media platforms that would help UK SMEs – and how they can get the most out of each one. When you’re a small company with growth ambitions, social media can be a frustrating task that impedes the actual running of the business. But for UK SMEs, social media can be the fuel that launches the growth rocket. This is because Brits love to tweet, like, pin, you name it. According to Avocado research, 83% of the adult population currently uses one or more channels. How’s that for a reason to use social media? At its core, social media allows you to raise brand awareness and reputation. But it’s when you start investing time and effort into your chosen platform that the benefits truly shine. Eleanor Wright, founder and creative director at Soello, rounded up its long-term results well: “Customers and businesses will start to communicate on a one-to-one basis, seeking each other out naturally. Customers also turn to social media to express their needs with a business or raise queries. “Over time, you’ll be able to take that information and create the ultimate customer experience. These interactions give businesses a better insight into their audience, so they can identify the likes and dislikes of individuals. Think of it as a constant education tool. You get to understand the way your target customer thinks in real-time. It will also help you flesh out and showcase your brand personality. And, as Sprout Social found in 2017, nailing your tone of voice can lead to increased sales. If you’re looking for an example of a company with an excellent read on customer expectations then look to Innocent Drinks. The company has sussed out what personality gels well with its audience and uses it as the foundation for anything it does across social media. Now it has a 31,500-strong following on Twitter – and posted annual revenue growth of 22%. Wouldn’t you go out and buy a smoothie after reading this tweet? Which social media platforms make the most sense for UK SMEs? It makes sense to want to reap those benefits. But which social media platform should you focus on? No click of the fingers will give you instant results. You have to stick with it in the long-run – on a consistent basis at that. Don’t overload your social media senses. If resources are low, select one or two platforms to engage on. Make sure your target audience is using that platform. Facebook reigns supreme on a global scale. There will be naysayers. 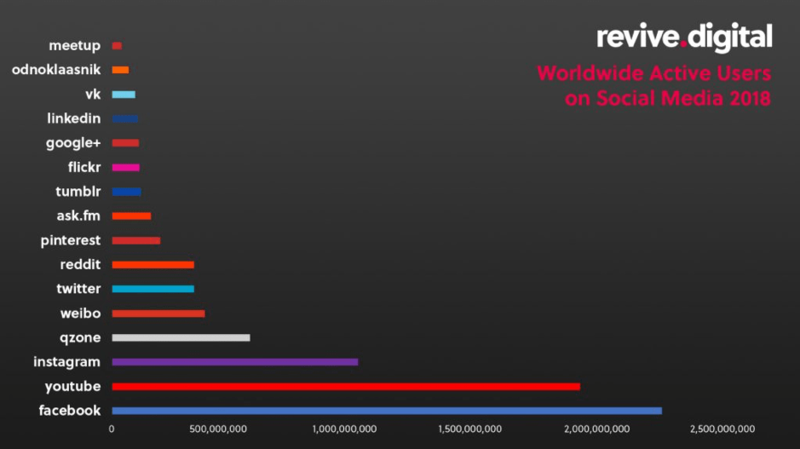 Many point to a plateau in Facebook’s user growth, but this revive.digital graph puts it into perspective. If your audience is international, then it would make more sense to tap into YouTube and Instagram. But the chart looks a little different when you zone in on the UK. While Facebook has some 32,000,000 users in the UK alone, it’s Twitter that comes in as the second most used platform with 20 million users. These two graphs, combined with those three points of consideration, should give you a feel of what works best for your business. Where can UK SMEs find out more about how to get most out of the relevant social media platforms? If you’re looking for more information, there’s a ton of content out there. But here are some of the best sources we found – each dedicated to one of the top UK social media platforms. Facebook is the top dog of the social media world. If you want to know the ins and outs of the platform, then this interactive guide sheds plenty of advice. It tackles everything from page management to boosting engagement. SproutSocial has compiled a 26-strong tip list fro Twitter – and it doesn’t skimp on detail. Each point is relevant, from the need to tweet often to the necessity of jumping on relevant trends. It’s a good read sure to get the ideas flowing. YouTube can be a tricky platform to handle. The British Library has you covered though. Although it’s packaged as being for startups, its guidance is just as relevant for SMEs. It takes you through the entire process, emphasising the need for video keywords and the ability to stick to a certain posting schedule.